So great to be back in the Bay Area. I don’t even mind the rain. Jamie, Jayda and I (and my niece Jennifer from New York, who’s helping out with Jayda while Jamie recovers from wrist surgery) are back in the same great Lafayette house we rented last year. Saturday night one of our neighbors is having us over for a “welcome back” barbecue. I really love this place and this team. It’s like family to me. I feel like the dad to all these young guys. So returning here has been like getting my family back. 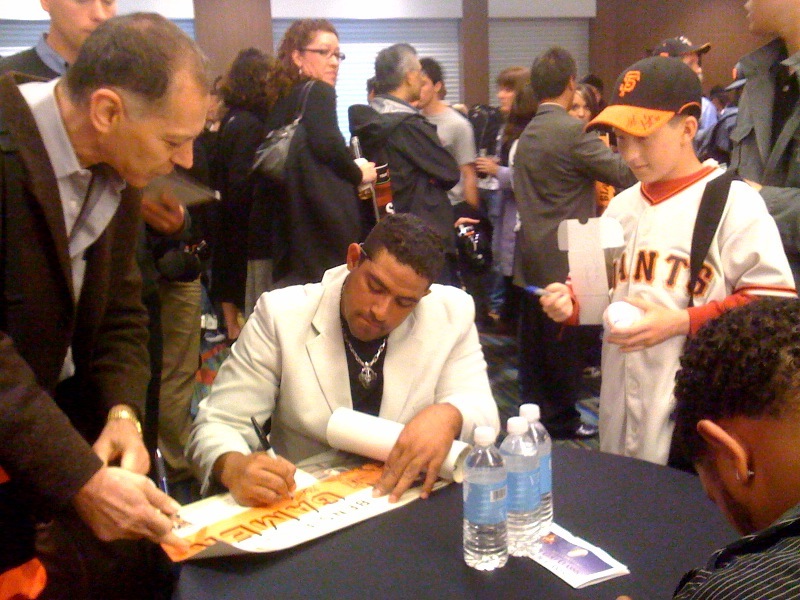 Today we got to meet a lot of fans at the “Play Ball” luncheon at the Marriott Marquis in San Francisco. It’s a fundraiser for “Junior Giants” and the Giants Community Fund, and they were saying they raised about $300,000, which is amazing. There were almost 1400 people there. Some of the fans didn’t know the new guys, so I heard that Jeremy Affeldt was pushing people toward Mark DeRosa because no one was asking for his autograph. Another of the new guys, Aubrey Huff, made a colorful first impression with his purple plaid pants. (I’ve included a photo here.) I noticed that Brian Wilson is so dedicated to his nutrition regimen that he actually brought his own lunch today in a vacuum-sealed bag. I can’t wait for the season to start on Monday. I’ve been telling Jamie that there’s something really special about this team. Everything we’ve been working for the last three years, this is the year it’s all going to come together. I really feel that. See you this weekend and then for Opening Day on Friday! I ended yesterday’s post saying it’s impossible not to be excited and ready to play with this team. Juan Uribe is one of those guys who seems to carry a current of electricity inside him. He makes things happen whether he’s in the clubhouse or on the field. Before games, he’s at the center of the fierce Domino games at the table near my locker. He, Renteria, Brian Wilson and a few others are there slamming the tiles down and hooting at each other. On the field, well, you’ve seen what he can do. Two home runs and a triple yesterday. He always finds a way to get us going and keep us fired up. Then there’s Pablo, who continues to amaze all of us. That play yesterday at first? He was like Superman flying to right to stop that ball. He might not look like your typical star athlete, but he’s such a natural. He has all the tools. He’s fast. He’s strong. Look at his forearms. They’re huge. He’s incredibly agile – you have to be agile to play third base, first base and catcher. Plus he can hit. He’s the whole package. And having Freddie Sanchez back in the lineup really makes a difference. He’s a proven Number 2 hitter. He can go the other way. He’s not afraid of a sacrifice bunt. He knows how to move the runners over. He makes the whole line-up stronger. It’s always a shot in the arm when we get the September call-ups and the young guys join the team for the last month of the season. Much was made last week about the Giants management “trying to light my fire” by adding Buster Posey to the roster. When reporters asked if I thought the Giants were “sending me a message,” I answered honestly. I didn’t think that’s what was happening. But I said IF the Giants were trying to send me a message to heal faster from my muscle strain, it’s kind of an odd thing to do. I have never given less than 100 percent, and the Giants know that, so what would be the point of “sending a message”? I think it was reporters looking for an angle. So before the game the other day, I was standing near Posey in front of some reporters and joked, “Hey, you better not light that fire too much. I don’t want you to burn my ***!” Buster kind of looked at me funny. I guess he hadn’t read the paper. Later I explained it to him. He laughed. That kid is amazing. He’s so humble. Such a nice guy. I think he’s going to be a superstar. I saw him sitting one day by himself in the dugout, so I called him over, (I wasn’t playing, either.) We started talking about catching and strategy and how to last a long time in the big leagues. If he’s going to take my job someday, I want him to be the best. I want him to take care of these pitchers. I want him to help these guys and be a winner. I’d love to stay here and work with Posey when the time comes. I don’t want to go anywhere else. But it’s the Giants’ decision to make. It’s out of my control. The truth is I don’t spend much time thinking about what’s going to happen next season. I’m thinking about right now, today. Who are we facing? How do we pitch them? How to win this game and then the next game? Nothing’s better than playing games that matter in September. Thanks for reading. See you at the park!